I don’t remember the first time I ate a pickle, but I know it was in the last two or three years. Year after year after year I had asked for them to be removed from hamburgers or sandwiches. You would never find a jar of pickles in my refrigerator, and if one was served to me, I immediately handed it off to Ryan or my sister. Again, I don’t know what prompted me to give one a try, but I’ve been hooked ever since one passed my lips. I’m now the obnoxious person asking for extra pickles or sneaking it off of your plate when you aren’t looking. 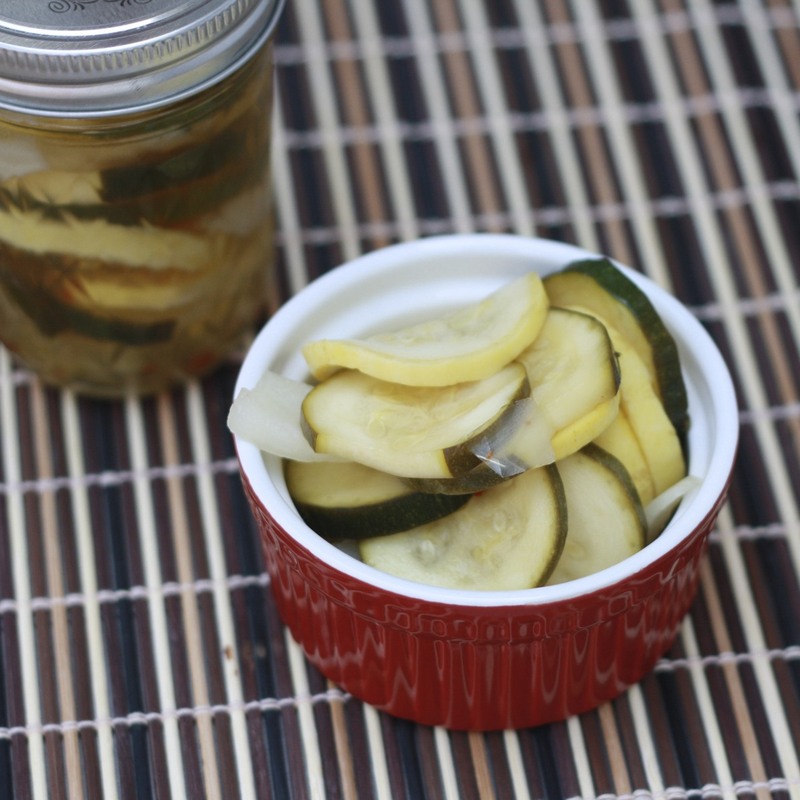 Despite this newfound love for pickles, I hadn’t ever tried them homemade. It’s been on my cooking to do list, though, and after enjoying the pickled vegetables in both my appetizer and meal at The Block, I decided pickles would be the “repeat” portion of my Eat and Repeat Challenge this month. I debated between making traditional pickles or an assortment of vegetables, like I’d had at The Block, when I found a recipe for pickled squash in the June Cooking Light. I already had everything I needed and I spent a Sunday afternoon whipping up the rather easy recipe. After a twenty-four hour rest in the fridge, I sampled the “pickles”. True to Cooking Light’s description, they were meatier than your standard pickle. They weren’t breaking or watery like pickles sometimes are. They were full of the vinegary flavor I’ve come to love in pickles and the heat from the crushed red pepper gave them a little extra pop. These didn’t last long in our fridge. In fact, I may or may not have taken a little jar of them to work the next day to snack on. Pickles for a snack at work? Not normal, I know! And no, I’m not pregnant!!! Instead, I like to think I’m catching up on years and years of missing out on pickles! 1. Place two wire racks on two baking sheets. Arrange zucchini and squash on rack and sprinkle with 1 tsp salt. Allow to stand for 30 minutes. Rinse well under cold water and pat dry with paper towels. 2. Place zucchini, squash, and onion in a medium sized glass bowl and set aside. 3. Combine remaining 1 tsp salt, 1 cup water, cider vinegar, maple syrup, and crushed red pepper in a small saucepan. Bring to a boil and pour over vegetables. Weigh down vegetables with a plate. Cover and refrigerate for at least 2 hours or overnight. Drain or serve with a slotted spoon.